Streamingoldies > Ray's Rants > Happy Birthday! On July 24, 1701, Antoine de La Mothe, Sieur de Cadillac landed on the banks of Le Détroit Du Lac Erie (The Strait of Lake Erie) and established Fort Pontchartrain du Détroit. • There would have been no Detroiters to volunteer to fight during the American Civil War, including the 24th Michigan Infantry Regiment (part of the legendary Iron Brigade) which fought with distinction and suffered 82% casualties at Gettysburg in 1863. • Henry Ford would not have started the Ford Motor Company there in 1904. • Dodge, Packard and Chrysler would also have started someplace else. • There would not be a Detroit Tigers baseball team so Jim Bunning wouldn’t have thrown that no-hitter against the Red Sox and an 8-year old kid (me) would have missed a chance at watching history unfold. • Berry Gordy, Jr. wouldn’t have been born there so he wouldn’t have named his label Motown because the “Motor City” wouldn’t have existed. • The Supremes, Jackson 5, Four Tops, Stevie Wonder, Marvin Gaye and so many other talented acts might have signed with a label less interested in promoting them … or they might have failed to sign with any label, and then where would we be? 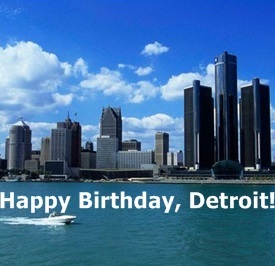 • With all of that in mind, we gladly wish Detroit a very Happy 317th Birthday! • Let’s be honest, anyone who is stuck with the Detroit Lions as their football team deserves a smile or two.